Looking for ways to fund your education? If you can demonstrate academic excellence and leadership, you may qualify for a UH scholarship at the University of Houston. Here’s a look at the options. You also may want to explore scholarships from outside sources by browsing websites like StudentScholarships.org, Collegeboard, Hispanic College Fund, The National Data Base Scholarships and US College Scholarships and Grants. Questions? Contact the Financial Aid Office. NOTE: State law requires that each student identify any relation to a current University of Houston Board of Regents member. A student who is related to a current member of the governing board of that institution is prohibited from receiving scholarships unless the scholarship is awarded exclusively based on academic merit or is an athletic scholarship. The state of Texas provides funding for multiple scholarships available to outstanding students attending Texas colleges and universities. Some of the scholarships will require students to maintain a certain GPA or be part of a specific degree program. Additionally, most of the scholarships require students to be a Texas resident. The purpose of this program is to increase the number of highly trained and educated professional accountants available to serve the residents of this state; improve the state's business environment and encourage economic development and financial stability; and identify, recognize and support outstanding scholars who plan to pursue careers in accounting. This scholarship program was established to encourage academically talented students from the countries of the Western (American) hemisphere to pursue higher education in the State of Texas; thus, establishing a beneficial link between the State of Texas and their home countries. For additional information, please click here. The highest ranking graduate of each accredited high school in Texas is exempt from tuition only at public colleges in Texas for two semesters of the first regular session following graduation from high school. For more information about this exemption or the application process, please contact the University of Houston’s Office of Student Business Services at 713-743-1010, option 6. The License Plate Insignia Scholarship Program provides financial assistance to needy students attending eligible public or private, non-profit colleges and universities in Texas. The amount of funding available for the program depends upon the number of license plates purchased bearing the insignia of Texas colleges and universities. The purpose of this waiver is to permit a small number of individuals with financial need and are citizens of Mexico, to enroll in any public university in Texas while paying the resident tuition rate. In order to guarantee your application is processed by the first payment deadline of each semester, applications must be submitted by the deadlines provided. However, applications may be submitted after the stated deadline. Incomplete applications will not be considered. Click here to apply. TASSP is a scholarship available to any Texas resident who is interested in pursuing either a commission in one of the Armed Services or will join the Texas Army National Guard, Texas Air National Guard, the Texas State Guard or the U.S. Merchant Marine upon graduation. One of the requirements is to be appointed by the governor, lieutenant governor, state senator or state representative. Click here for more information. The EAE program encourages Educational Aides to complete full teacher certification by providing need-based exemptions from the payment of tuition and certain mandatory fees at Texas public institutions of higher education. Please click here to view eligibility requirements and to download the current application. Apply for admission to UH for the fall semester immediately following high school graduation. Complete your application for admission, including the submission of all supporting documentation (application, application fee, official transcripts, and test scores), by the priority date. For Fall 2019 applicants, the priority date is November 15, 2018. Qualifications: Your completed admissions application allows you to be automatically considered for the Academic Excellence Scholarship. Awards are based on standardized test scores, high school class rank and high school GPA. Eligible students will have a competitive academic profile – typically a total score of 1260 on the new SAT (Evidence-Based Reading and Writing + Math) or an ACT Composite of 26, with a class rank in the top 20 percent. Admitted applicants who are eligible for Academic Excellence Scholarship will be notified via U.S. mail beginning Jan. 1. Students with no class rank: Students without a class rank can still be considered for Academic Excellence Scholarships. In such cases, the University determines scholarship eligibility based on the other information available, namely test scores and high school GPA. Scholarship reconsideration: Students can request reconsideration for the Academic Excellence Scholarship based on new SAT/ACT test scores and/or class rank information. For Fall 2019 applicants, reconsideration requests will be accepted through Jan. 31, 2019. Students are responsible for submitting new high school transcripts and/or SAT/ACT test scores to the Office of Admissions. Students must then notify the Office of Scholarships & Financial Aid that they would like their files to be reviewed again by calling (713) 743-1010, option 5, or visiting the Welcome Center. Qualifications: For students who have a competitive academic profile and demonstrated leadership skills. Recipients are selected by the Student Financial Support Committee from among the pool of admitted applicants. No additional application is necessary. Amount: Full cost of tuition and required fees, for four years (five years for architecture students). In addition, recipients are eligible for a one-time $1,000 undergraduate research stipend and a one-time $2,000 study abroad stipend. Candidates who complete the FAFSA may be eligible for additional financial support. See the chart below for a summary of benefits. Qualifications: The University of Houston will automatically award scholarship support to National Merit Scholarship finalists who select the University of Houston as their first-choice institution in accordance with the rules and deadlines established by the National Merit Scholarship Corporation (NMSC). *Estimate based on typical undergraduate tuition and fees as of 2018-2019. Tuition and fees vary by program and number of credits taken. Fall 2019: To learn more about the Tier One Scholarship and the selection process, please visit the Tier One Scholars website. Any scholarship counts as a financial resource and must be considered when constructing a financial aid award package. A student’s total financial aid cannot exceed the cost of attendance (COA). COA is an estimate of what it costs the typical student to attend the University of Houston. Your COA includes tuition and fees, room and board, books and supplies, transportation and personal expenses. Exceptions are made for Federal Pell Grant recipients, whose financial aid packages can add up to the COA plus the amount of the Federal Pell Grant. Awards from the University of Houston are subject to change depending on the entire student award package and the student's COA. Complete and pass a minimum of 30 credit hours of enrollment at the University of Houston (central campus) every academic year. Transfer hours and AP/dual credit hours will not count toward the annual 30-hour requirement or the cumulative GPA requirement. Hours taken at UH’s Clear Lake, Downtown and Victoria campuses also do not count toward the 30-hour requirement. Credit hours for repeated courses do not count toward the semester and annual credit hour requirements. If you have AP credit for a course and you take the course at UH, it is considered a repeat course and will not count toward your credit hour requirements. Your advisor can help you remove AP credit if necessary. Courses completed with grades of I, U, W or F are not counted toward the semester and annual credit hour requirements. Summer courses may count toward the completion of the 30 credit hours, but tuition and fees for those courses will not be funded by the scholarship. The University strongly recommends completing at least 15 credit hours each fall and spring semester. Students must be enrolled full-time (at least 12 credit hours) each semester in order for their scholarship funds to credit to their account. The Astronaut/Space Studies scholarship is for students interested in becoming an astronaut or pursuing a career in the nation’s space program. Scholarship applicant must be a certified full-time degree-seeking student, maintain a 3.0 GPA and provide notice to the Office of Scholarships & Financial Aid of summer work with NASA or another space related organization. Scholarship prospect’s studies must demonstrate some area of preparation for a career in the space program. Eligible programs of study: Bachelor of Science in Physics, Master of Science in Space Architecture, Master of Science in Aerospace Engineering, Master of Science in Materials Engineering, Master of Science in Industrial Engineering or a Doctor of Philosophy in Aerospace Engineering. Scholarship is renewable for up to 8 semesters. For instructions on how to apply, click here. The Delphian scholarship is based upon merit, character and financial need. It is only available for the Fall and Spring semesters, up to 8 semesters or graduation, whichever comes first. Students will be considered without regard to gender, age, religion, race or ethnic origin, but must be a citizen or permanent resident of the United States. Qualifying applicants must be classified as an undergraduate sophomore, junior, or senior, have a minimum cumulative GPA of 3.0 from all colleges attended as well as maintain full-time enrollment (12 credit hours) each semester. Additionally, applicants must submit an official University of Houston transcript and/or transcripts from any previously attended university or college with the application. The Carole and Jim Hegenbarth scholarship was established to help first generation students achieve their dream of higher education. Eligible applicants must be certified undergraduate, degree-seeking students in good standing with the University of Houston, and demonstrate financial need as determined by the FAFSA. The CenterPoint Energy UH Alumni Scholarship Endowment is for dependents of CenterPoint Energy employees, or an employee who has been working for CenterPoint Energy for at least one year. Applicants must be less than 26 years old, attend school full time and show financial need according to the FASFA. For instructions on how to apply, click here. This scholarship is open to any creative-thinking, undergraduate student at the University of Houston. To qualify, a student must be full-time (12 hours or more) with a minimum 3.0 cumulative GPA. Applicants must submit a one-page essay describing how they exhibit “creative” and “inventive” qualities. For instructions on how to apply, click here. The Franklin Virginia Law Scholarship is open to any degree-seeking undergraduate student who is in good academic standing at the time the scholarship is awarded. To qualify, the student must be enrolled full-time (12 hours or more) with a minimum 2.0 GPA or graduated from an accredited Texas high school with a minimum of 2.5 GPA, and have a financial need as determined by FAFSA. The student must demonstrate leadership qualities and shall submit two (2) letters of recommendation for the scholarship (preferably from teachers and professors). Student must be a United States citizen or permanent resident and a resident of Texas for fifteen (15) years preceding the date the scholarship is awarded. For instructions on how to apply, click here. The Houston Office Leasing Brokers Association (HOLBA) Scholarship is for students in the College of Business Administration, Engineering, Social Sciences (Economics), and/or Technology. Scholarship applicants must demonstrate an interest in pursuing a career in office leasing or commercial real estate, be a certified junior or senior degree-seeking student in good standing, must be enrolled for minimum of 12 hours each semester of awarding, and maintain a 3.0 GPA or better. For instructions on how to apply, click here. 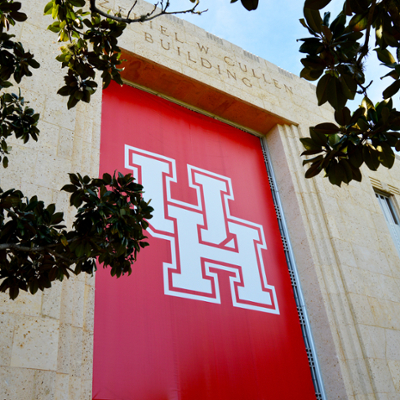 Undergraduate scholarship applicants must have completed at least 24 credit hours at the University of Houston. Graduate scholarship applicants must have completed at least 12 credit hours. Scholarship applicant must be a certified full-time undergraduate or graduate degree-seeking student in good standing at the University of Houston. Scholarship applicant must not be on academic or disciplinary probation. Scholarship applicant must have and must maintain a GPA of 3.0 or greater. Scholarship recipient may accept other scholarships and grants in conjunction with this scholarship up to the cost of attendance, which includes tuition, fees, books, room and board, transportation and personal expenses. Scholarship recipient may re-apply for the M.A. Jinnah Scholarship each year the application is open. Applicants for the Peggy & Bill Shiffick must be full-time, undergraduate, degree-seeking students who demonstrate financial need (as determined by the FAFSA or TAFSA) and have a minimum of a 3.0 GPA. The Robert and Esther Stadtler Scholarship is open to sophomores and seniors who are seeking a degree at the University of Houston. To qualify, students must be full-time (12 hours or more) with a minimum 3.0 cumulative GPA and have financial need as determined by FAFSA. Students must also submit their résumé and a brief statement detailing leadership qualities, character, scholastic ability and achievements. For instructions on how to apply, click here. The Woman’s Club of Houston Scholarship is a one-time, annual award of up to $1,500. To qualify, an applicant must be a certified junior or senior student seeking an undergraduate degree in the field of Education or Fine Arts for Fall 2016/Spring 2017, enroll in a minimum of 12 credit hours each semester of award and maintain a 3.0 GPA. The applicant also must demonstrate an interest in contributing to the community through participation in community service activities. In addition, the applicant must be a U.S. citizen or permanent resident. For information on how to apply, click here. The University of Houston encourages undergraduates to participate in research with a faculty mentor. In addition to programs offered through various departments and colleges, two programs currently award a stipend for qualified students from all majors to engage in a mentored research experience. Any junior or senior who has either successfully completed at least 12 hours in residence at UH with a cumulative GPA of at least 3.0 OR who has completed fewer than 12 hours in residence at UH but has a 3.5 cumulative GPA on all college level course work taken at UH or elsewhere is eligible to apply. Applicants must have earned at least 60 credits by the beginning of the mentorship period and must enroll and maintain a minimum of 12 hours in the semester of the award unless they are graduating that semester. Students who have participated in the PURS program at UH in a prior semester are ineligible to reapply. Qualifications: The Summer Undergraduate Research Fellowship program at the University of Houston (SURF-UH) seeks to provide funding for rising UH sophomores, juniors and seniors to participate in a focused, full-time, 10-week research experience (June 5 - Aug. 9) under the direction of UH faculty. Current freshmen that will be sophomores in Fall 2017 are eligible to apply for the fellowship. However, students graduating in Spring and Summer 2017 are not eligible for this program. No course credit will be offered for participation in this program, and students who have previously participated in the SURF-UH program are ineligible to reapply. Students receiving non-UH scholarships for travel/study/internship/volunteer opportunities abroad are required to visit Learning Abroad prior to their departure in order to be in compliance with UH Safety and Health regulations. For complete listing of available scholarships, please visit Learning Abroad Scholarships. Most colleges at the University of Houston offer scholarships specifically for students in those colleges. To be considered for a college-specific scholarship, submit an application through the appropriate college. Each year, a number of foundations, corporations, and individuals provide funding for UH scholarships. Some of these privately funded scholarships are designed to support students in a particular discipline or from a specific heritage or geographic region; others are open to students of any major or background. Offerings change often according to availability of funds and the time of the school year. The Alief Achievement Scholarship Fund Scholarship will be used to award Alief Independent School District High School seniors who exhibit leadership skills and will attend the University of Houston Main Campus. Scholarship applicant must also demonstrate financial need. To apply, applicant must submit résumé, two letters of recommendation and a 500-word narrative outlining why applicant wants to attend the University of Houston and how this scholarship will enable him/her to meet his/her goals. All scholarship documents should be submitted to the Office of Scholarships and Financial Aid. If selected, scholarship recipient must maintain a cumulative 2.75 GPA and remain a full-time student (a minimum of 12 hours per semester) at the University of Houston (main campus). Scholarship award is renewable for a maximum of 4 years (or 8 semesters) provided the recipient continues to meet the eligibility requirements. For instructions on how to apply, click here. The Alonzo Cantu Scholarship is for incoming freshmen who graduated from any high school in Hidalgo County, Texas. Scholarship applicants must be ranked in the top 25 percent of their graduating class, demonstrate financial need and be Pell Grant-eligible. Students will be evaluated based on academic achievement, letters of recommendation and a personal statement. The award is renewable for up to four years with a maximum amount of $16,000 for students who maintain a 2.75 GPA, full-time enrollment, and remain Pell Grant-eligible. Applicant must be a U.S. citizen or permanent resident. Recipients may receive the Alonzo Cantu Scholarship and additional scholarships to assist in paying for college. For more instructions on how to apply, click here. The Army Reserves Officers' Training Corps (AROTC) Scholarship is awarded for academic and personal achievement and pays annually an amount determined by the U.S. Army. The scholarship includes funding for tuition, a flat rate for textbooks, equipment, and supplies, and a subsistence allowance. Recipients must enroll and fully participate in Army ROTC. Four-year AROTC scholarships are applied for during the latter part of the junior or the early part of the senior year of high school. Two- and three-year AROTC scholarships are applied for during the sophomore and freshman years, respectively, through the Department of Military Science. For further information, contact the Military Science Department at 713-743-8460. The Bangladesh America Literary, Art and Cultural Association Scholarship is for undergraduate and graduate students who are interested in Bangladeshi history, art, culture or literature. Students must submit an essay expressing their interest, and be enrolled full time. The scholarship is nonrenewable. Applicants must reapply. Recipients may receive the Bangladesh America Literary, Art and Cultural Association Scholarship and additional scholarships to assist in paying for college. For more instructions on how to apply, click here. Barnes & Noble is pleased to be a member of the University of Houston (UH) community. Barnes & Noble will award scholarships to selected UH students who have been admitted to undergraduate programs to support student success and access at UH. As a UH partner, we have committed to providing the Textbook Scholarships. Qualifying applicants who meet the eligibility requirements below are invited to apply. Selected applicants will receive a total of $1,000/academic year ($500/semester). This is a renewable scholarship award for a period of 2 years (based on 2 semesters per classification level) for a maximum award of $2,000. Any funds not used will be returned to the Barnes & Noble Textbook Scholarship account. For instructions on how to apply, click here. The Mladenka-Fowler Scholarship offers financial assistance to full-time students at UH who encounter economic hardships that might oblige them to withdraw from full-time progress towards graduation. A campus network and community that is dedicated to student success. Please click here to access the application and additional information. The George Family Scholarship is open to any degree-seeking undergraduate student that has graduated from the Aldine Independent School District in Houston, Texas. To qualify, the student must have graduated high school with a 2.75 GPA or higher and be enrolled full time (12 hours or more) and maintain a minimum 2.75 GPA. For instructions on how to apply, click here. The Gerald W. McElvy Scholarship was funded by alumnus and Board of Regents member Gerald W. McElvy. The scholarship recipient(s) must declare an intent to teach mathematics or science in a middle or high school, or — with an interest in pursuing a career in business — declare a major in the C.T. Bauer College of Business. The scholarship recipient(s) will be determined by the UH Scholarship Selection Committee. Financial need, as determined by federal or state methodology, is a consideration. For instructions on how to apply, click here. The Mark and Judith Cook Foundation are pleased to award a full-ride scholarship to students who have been accepted to the University of Houston (main campus). Applicant must be a Texas resident, U.S. citizen or permanent resident and have a permanent address in the Tamina community located within zip code 77385. Scholarship applicant must also demonstrate financial need. Applicant must submit a résumé, two letters of recommendation and a 250-word narrative outlining why applicant wants to attend the University of Houston and how this scholarship will enable him/her to meet this goal. All scholarship documents should be submitted by to the Office of Scholarships and Financial Aid. If selected, recipient must live on the UH campus a minimum of the first two years of his/her college career. Scholarship recipient must maintain a cumulative 2.75 GPA and remain a full-time student (a minimum of 12 hours per semester) at the University of Houston (main campus). Scholarship award is renewable provided the recipient continues to meet the eligibility requirements. Scholarship award covers up to 8 semesters (or up to 10 semesters if student is enrolled in a 5-year program) including tuition and fees; on-campus room and board or the equivalent; books and University of Houston sponsored student health insurance. For instructions on how to apply, click here. UH Dining Services (UHDS) is pleased to be a member of the University of Houston (UH) community. UHDS will award scholarships to selected UH students that have been admitted to undergraduate programs to support student success and access at UH. As a UH partner, we have committed to providing the Meal Plan Scholarships. Qualifying applicants who meet the eligibility requirements below are invited to apply. For instructions on how to apply, click here. The Houston Livestock Show and Rodeo's educational program is a significant part of the Show's mission — benefiting youth, supporting education, and facilitating better agricultural practices through exhibitions and presentation. Because college is only a dream for so many students, the Show has made an extraordinary impact on the lives of countless young men and women in its quest to benefit the youth of Texas and support them through education. Qualifications: For graduates from a Texas high school or home school who demonstrate financial need, a record of leadership in school and community, and strong academic abilities, as evidenced by grades and SAT scores. have a 3.0 GPA (on a 4.0-point scale). Awards are offered to eligible applicants for fall admission, as funding is available. No separate scholarship application is required. Transfer Excellence Scholarships qualify for non-resident tuition waivers. Transfer Excellence Scholarships are renewable for one additional year, provided that recipients complete and pass 24 credit hours at the University of Houston (central campus) and earn a cumulative GPA of 3.0 by the end of their first spring term. Awards are offered to eligible applicants as funding is available. No separate scholarship application is required. Transfer Achievement Scholarships are not renewable, and do not qualify students for non-resident tuition waivers. Applicants must demonstrate financial need, a record of leadership in school and community, and strong academic abilities (minimum 3.0 cumulative GPA). Applicants also must meet U.S. and Texas residency, citizenship requirements sufficient to qualify for in-state tuition and financial aid as well as have completed at least 30 hours of transferable, post-high school credit in residence at a Texas college or university at the time of application. For additional requirements and information, please visit the Terry Foundation Scholarship Program website. Applicants must demonstrate active involvement in international education activities, have completed one semester of full-time study at the University of Houston and be currently enrolled full-time. All undergraduate applicants must have at least a cumulative 3.0 GPA, and all graduate applicants must have at least a cumulative 3.5 GPA. For United States citizens and permanent residents, financial need will be determined by guidelines from the UH Office of Scholarships and Financial Aid. State law requires that each student identify any relation to a current University of Houston Board of Regent member. A student who is related to a current member of the governing board of that institution is prohibited from receiving scholarships unless the scholarship is awarded exclusively based on academic merit or is an athletic scholarship. Disclaimer: Reference within this site to any specific scholarship or organization by trade name, trademark, manufacturer or otherwise does not constitute or imply an endorsement, recommendation, or favoring by the University of Houston or the Office of Scholarships and Financial Aid. Links to external or third-party websites, are provided solely for visitors' convenience. The University of Houston does not endorse or accept any responsibility for the content or the use of such websites. The University of Houston’s Office of Scholarships and Financial Aid does not give any representation regarding the quality, safety, suitability or reliability of any external websites or any of the content or materials contained in them. It is important for users to take necessary precautions, especially to ensure appropriate safety from viruses, worms, Trojan horses and other potentially destructive items.